Yeah, yeah, O.K., so the glaciers are melting, polar bears are becoming extinct and oceanfront property will soon open up in Philadelphia. But c’mon, people, try to look at the bright side. Consider this: the new environmental awareness is unleashing a wave of innovation in every category of technology — including portable music and video players. And how, you may ask, can an iPod wannabe be green? By being totally self-powered, for one thing. 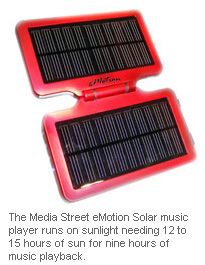 Already, there are two such players: the Media Street eMotion Solar ($160 to $190, capacities from 1 to 4 gigabytes) and the Baylis Eco Media Player ($200 from realgoods.com, 2 gigabytes). Neither needs batteries or power from a cord; they can live completely off the grid. The eMotion Solar (5.5. x 3 x 1 inch) opens like a book, revealing two broad, black, shiny solar panels. To charge this machine, you just stick it where the sun does shine, like on a windowsill. Even on an overcast day, its little Recharge indicator light pops on. The battery recharges after 12 to 15 hours of exposure to sunlight, which the company says is enough for nine hours of music playback. Then again, if you’re in direct sun, you don’t even care about the battery; sunlight alone is enough to drive music playback. The Eco Player, on the other hand, has a built-in crank on the back, no more obtrusive than a belt clip. The winding turns out to be kind of fun, thanks to just the right amount of resistance. According to the company, one minute of winding generates enough power for 40 minutes of music playback. A fully charged battery can play music for 20 hours, or video for 10. Now, let’s be real here; media players aren’t exactly high on the greenhouse-gases Most Wanted list. Every little bit helps, of course, but the snows of Mount Kilimanjaro haven’t melted because you’ve been listening to too much heavy metal on your iPod. Fortunately, self-powered players have other charms. They’re indispensable for backpackers, campers and anyone else who plans to be away from a power outlet for a while; indeed, both the Solar and the Eco Player are ruggedly built, with rubberized nonscratchable surfaces. There’s a secret bonus feature, too: you can use these players to recharge other portable gadgets. Yes, these players can drag less environmentally enlightened electronics off the grid along with them. To make this work, you connect your secondary gadget to the eco-player’s U.S.B. jack using the appropriate adapter cable. The eMotion Solar comes with 12 such tips, most intended for cellphones and things that can be charged from a U.S.B. jack (including BlackBerrys, Treos and even iPods). The Eco Player, on the other hand, recharges only cellphones (it comes with five cable tips), and only while you’re cranking. One final attraction, even for nonhikers: these machines are among the very first products to address the rarely discussed Accessory Fatigue Syndrome. Every time you buy a gadget — a phone, camera, music player — you’re not just adding one item to the list of things you have to pack, track and care for; you’re adding two or three. Another power cord, another cradle and another set of earbuds. Own several of these things, and it gets exhausting to keep them organized and accounted for. These two new eco-players, however, can be completely self-contained. Both come with earbuds and a secondary charging method (the eMotion Solar has a traditional power adapter; either player can charge from a computer’s U.S.B. jack) — but none of that is required. You can toss the player into your bag by itself, without any cables or accessories; you can power it from the sun or the crank, and, in a pinch, listen through the built-in speakers. And you’re flooded with a strange sort of techno-relief. All right, now you know about these players’ astounding energy-saving features. How do they fare as music and video players? Um, well … hey, did I mention that they can recharge your cellphone? All right, let’s just admit it: next to the highly refined software and hardware design of the iPod and the Zune, these players look positively Neanderthal. The menus are crude and claustrophobic; on both players, messages appear in the Courier-ish font of an I.B.M. Selectric; and there’s no scroll wheel or touch pad for navigation. You walk through lists by pressing up/down arrow buttons. The Solar player’s design is a particular disaster. It’s shaped like a Game Boy with a big 3.5-inch screen and dual headphone jacks. Unfortunately, the buttons are also modeled on a Game Boy’s, with two four-button clusters on opposite corners. Trouble is, there are no dedicated controls for volume, Play/Pause, Previous/Next, and so on; all of the playback functions have been assigned to those gaming buttons. Learning which does what involves playing a lot of hide-and-go-click. The Baylis Eco Media Player is much smaller; it looks like the body of a little walkie-talkie. Its dim 1.8-inch color screen isn’t exactly Imax, but it does the job. The software is fairly easy to learn, but here, too, the design relies on iffy stunts like buttons that do one thing when tapped briefly, another when held down. Another reason these eco-machines aren’t iPods: loading them with music, video, text and photo files is a fully manual operation. You connect the player to your Mac or PC with a U.S.B. cable and then drag files onto its desktop icon. Copy-protected audio formats need not apply. 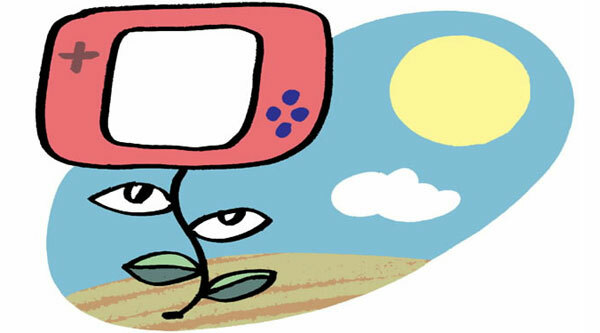 Each player recognizes only one video format; if you have videos in other formats, you must first convert them using a Windows-only utility program. You can add more storage with an SD memory card (up to 2 gigabytes for the Solar, 8 for the Eco). In short, fans of elegance and simplicity may turn red while deciphering these green players. Featurephiles, however, will have a field day. Both machines can play music, videos and photos. But they also have built-in microphones for audio recordings. The Eco player has a Line In jack for converting analog audio (from cassette tapes or record players) into digital files. Both machines can display text files, for your e-book reading pleasure. The eMotion Solar surrounds each line of text with a bright red rectangle — yet another design bafflement — but it offers a truly wacky bonus feature: it can read those text files aloud in a reasonably fluid computerized voice as you trudge along. Both players have great FM radios built-in, too. And both, believe it or not, have built-in L.E.D. flashlights — neat. The eMotion Solar goes off the oddball deep end with its inclusion of four old Nintendo games, just in case you plan to be stranded on a (sunny) desert island. In this mode, at least, those Game Boy-style buttons make sense. These eccentric machines are idiot savants: half muddled, half genius. In software refinement and quirkiness, they seem to have come tumbling out of the 1980s. And yet their ability to charge themselves and other gadgets works incredibly well—so well, in fact, you have to wonder what the rest of the electronics world is waiting for. If you are indeed a camper — or an executive road warrior who’s tired of playing Plug In My Gadget — then putting up with these players’ quirks might be worthwhile. The Baylis Eco Media Player, with its superb sound and tolerably pocketable size, is especially likable. If you’re anyone else, consider one of these players only if you think the emergency-power features might come in handy. If not, consider them the advance team for a new, very promising, very green world of products. This entry was posted in Tech News and tagged Media Player, Solar by sakinshrestha. Bookmark the permalink. Next → Next post: How to source Candidates Using Facebook?